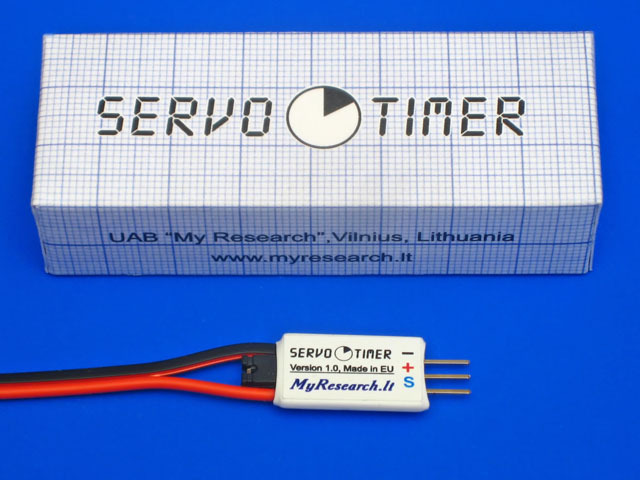 Servo Timer device is usable for activation of the mode of forced landing in freely flying aircraft models. The device is able to control any servomechanism with a delay of activation from parts of second to one hour. Freely flying models can fly in upward flows of air for very long time. To avoid flying away by a model, timers for forced landing are used. A timer can be used for switching off the engine as well. Any servomechanism of a standard remote control system can be connected to the output of the device. The device is fed by a 5V power supply. On switching on, the servomechanism is in the preset end position. After the expiry of the set period, the servomechanism transfers to an opposite position. Setting of the required value of the timer. Remove the jumper from the device. Switch on the device and activate the seconds counter. When the seconds counter achieves the required time interval, put the jumper on the device. You can choose a direction of operation of the servomechanism. On each subsequent tuning, the device switches on the reverse function  this means that the servomechanism will move in the opposite direction. The maximum value of the timer is 1 hour; the accuracy of time measuring is 0.02 s. On usual operation of the timer, it should be equipped with the jumper.